Both Henry VII and his son and successor Henry VIII took a personal interest in Wanstead and hunted there. In 1504 the former lay several weeks at Wanstead, recovering from illness. Nothing is known of the old manor house, Wanstead Hall, though a charter of Edward VI - which refers to "the capital mansion of our Manor of Wansted… now in great ruin and decay" - seems to suggest it was of some size. In Rocque’s plan of 1745, the present Shoulder of Mutton Pond is named the “House Field Pond”, which probably indicates that the old manor house had stood somewhere in the vicinity. A reference to its location in relation to Lord Rich’s later house, though vague, also tends to support this. 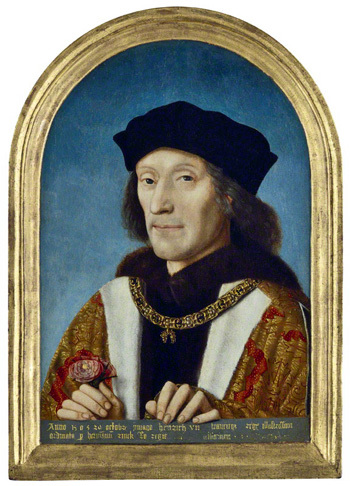 King Henry VII by an unknown Flemish artist. Image © National Portrait Gallery, London. In or around 1509, in the first defining moment of its history, Wanstead Park was “emparked”, or enclosed. 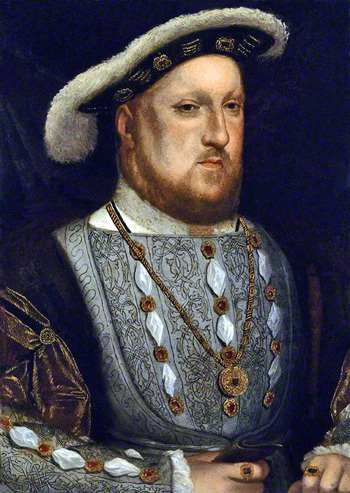 Henry VIII placed manor and park under a succession of keepers chosen from his close associates. In 1511 the keepership passed to Charles Brandon, Duke of Suffolk, who in 1515 became brother-in-law to Henry through his marriage to the King’s sister Mary, Dowager Queen of France. A later keeper was the unfortunate Sir Giles Heron (born before 1504, executed 1540). Giles Heron was the son of Sir John Heron of Hackney, Treasurer of the Household to both Henry VII and Henry VIII. Giles Heron himself was listed as an “esquire of the body” in 1532 – a personal attendant of the King. The office of esquire of the body, was of a very honourable nature. It is thus described in the household book of Edward the Fourth, Esquiers for the body, four, noble of condition, whereof always two be attendaunt upon the king's person to array and unarray hym, to watche day and nyght to dress hym in his clothes, and they be callers to the chaumberlayn if any thing lak for his person, or plesaunce; theyre busines is in many secrets, some sitting in the king's chaumber, some in the hall with persones of like service, which is called knyghts service, taking every of them for his lyvery, at night, a chete loffe, one quart wyne, &c. Their fee was 7½d. a day while in waiting . On his father's death in 1523 Heron had become a ward of Sir Thomas More. He married Cecily, More's daughter, in 1525. Sir Thomas More fell from favour after 1530, due to his opposition to the annulment of the King’s first marriage and the establishment of the Royal Supremacy over the Church. After More’s execution in 1535, members of his circle remained under suspicion and were subject to harassment. Heron's end came after he was denounced, by a tenant whom he had evicted, for “speaking too freely” of the King. His connection with Thomas More meant that this possibly malicious accusation, which in other cases might have attracted little attention, rapidly became a very serious matter. The evidence was so weak as to make it doubtful whether a conviction could be obtained through a normal trial, but the King’s ministers overcame this difficulty by bringing a Bill of Attainder against Heron for treason. Placed before the House of Lords, the Bill passed through both Houses within six days, and Heron was put to death in 1540 without any form of legal process. For further information on Sir Giles Heron, see History of Parliament Online.